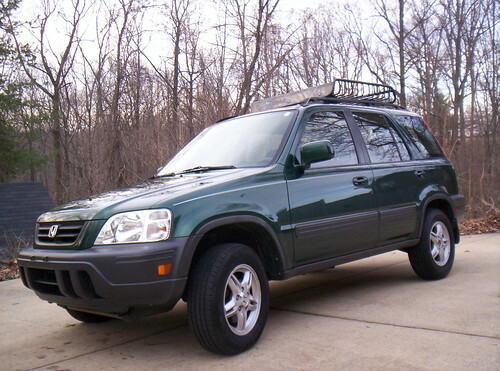 Interested in a 2000 Honda CRV? Then you are in luck. Check out mine for sale now at ebay! Maybe this will get picked up by Edgeio too for sale. We bought this 2000 Honda CRV in 2002 and have absolutely loved it ever since. We are the kind of people that like to get out and enjoy life, and this SUV has given us the ability to get there with all of our stuff! I was amazed at the capacity of this vehicle with the fold down seats and the roof rack. This car has ONLY been serviced at the Honda Dealerships with Genuine Honda Parts. It has been in a small fender bender (someone bumped into the door) but was repaired promptly at the Honda Repar Center and is in perfect working order. This car has always been owned by NON smokers and has always had all of its maintenance work performed on schedule including the 90k mile tune-up, new tires, frequent oil changes and lots of TLC. The CRV runs very well and is very comfortable for everyone to ride in. The interior fits 5 adults and has plenty of cupholders, armrests and storage for all of them. The CRV is very versatile on the inside with dual folding rear seats, a rear accessory charger, a built in picnic table and cooler in the back for tailgating, tie down straps and a few small compartments to keep things from rolling around. This car, like all Hondas, gets really good gas mileage and is a great highway vehicle. It is built on a civic chassis so it is very easy to maneuver, park and has a great turning radius. We have had no issues with this car but must unfortunately get rid of it. We have recently moved to California leaving our home and cars behind. We have no need for cars with public transportation so we must sell them all. The reserve is set at $7500 because that is what we need to pay off the loan. BONUS! We will be throwing in our Yakima roof rack/cage (shown) for gear and 2 Yakima bike racks (not shown) with locks with the CRV. We have used it to get our bikes all over the place but have no need for them after CRV is gone. Paid over $600 for it a few years ago, free for you! See the Ebay Auction Right Here.